Last night, the 11th annual “Jimmy Kimmel Live: After The Oscars” special aired on ABC, and there was a veritable piñata of surprises in store as Kimmel went all-out to give us hilarious segments. 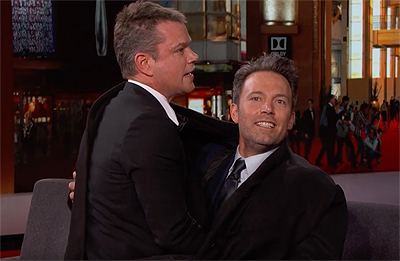 The festivities included a sit-down interview with Batman himself Ben Affleck, with the Oscar-winner sneaking in his best bud/Jimmy Kimmel adversary Matt Damon underneath his jacket. This wouldn’t be the only Damon cameo, and the night got even crazier as Affleck revealed putting on his Caped Crusader costume for his own son’s birthday party, as well as trotting out a “deleted scene” from Batman v Superman: Dawn of Justice featuring Kimmel that is so good it will make you wonder why it was ever cut. In addition, the special also aired two hilarious parodies, including a fake Creed sequel titled “Clubber,” featuring Tracy Morgan as Mr. T’s Clubber Lang character from Rocky III. Finally, there is the oh-so-apt ode to “The Producers” titled “Trumped,” which features Nathan Lane and Matthew Broderick reprising Bialystock and Bloom as they try to find a presidential candidate so bad he couldn’t possibly win, and find one in the form of… well, you know who. Check out all these clips below!